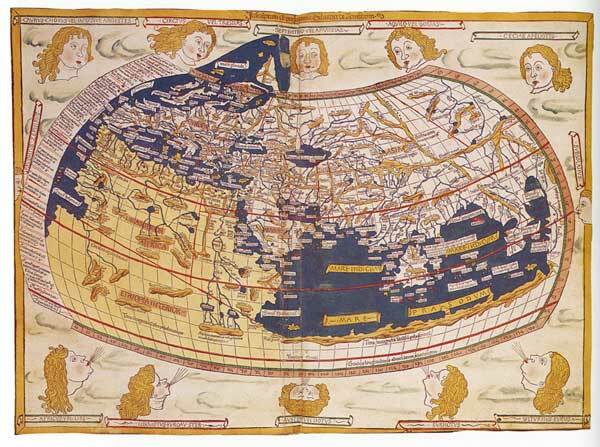 The first woodcut world map, following Claudius Ptolemy, the 2nd-century Alexandrian geographer and astronomer, with the contemporary addition of Scandinavia and Greenland (1482). Note the grid, and the the southern 'Terra Incognita'. Once it was possible to conceive of the whole world as a map, Greek aesthetic sensibilities dictated that there should be a southern body of land to balance that in the north. Australia was thus invented through the power of the map before it was 'discovered'. The term 'Aborigine' (upper-case 'a') refers specifically to the original peoples of Australia, whereas the term 'aborigine' (lower-case 'a') is used generically to refer to indigenous peoples around the world. If it is true that accuracy is linked to function, then indexicality cannot be simply equated with mere practicality. In other words, highly accurate maps are not really less indexical or less tied to their context of use. Instead it might be more illuminating to see various maps as having different modes of transcending indexicality. As we have seen in the case of the Ordnance Survey map, it cannot simply be 'read', even in conjunction with the key. Contour lines, for example, make no sense at all without training and facility in imagining a three-dimensional projection. Equally, contour lines can have no meaning without the existence of a plethora of assumption~, institutional arrangements and systems of measurement. The concept of sea level, the infra-structure of benchmarks, national surveys and instruments such as theodolites all constitute the 'forms of life' that are taken for granted in the creation of contour lines. Indeed the state has to put in enormous amounts of money and work to maintain this system of measurement. Were it to cease to do so, the forms of life that make the map possible would collapse and this fine creation would suffer the same fate as the map in Borges's story (ITEM 1.1). Thus, while Ordnance Survey maps are deliberately made to appear non-indexical, and to some extent are successful in that they do enable people strange to a particular piece of territory to find their way around, they are nonetheless highly indexical in that they are completely dependent on forms of life. Let us return now to ITEMS 2.7 and 2.8 and reconsider the questions raised about them. A stranger to the culture that produced such maps as these, or the Ordnance Survey map, would be unable to read them without the appropriate training, just as Westerners cannot read aboriginal maps, or even their own maps, without training. Thus the claim by Westerners that aboriginal maps are more indexical and hence less scientific than theirs springs largely from the transparency of the forms of life in which their maps are embedded. This reflects a difference in the ways the differing cultures achieve a transcendence of indexicality, rather than a difference in their correspondence to reality. Early Western Christian mappamundi (maps of the world) are called T-O maps. The world is divided by the three major waterways symbolising the cross, with east at the the top and Jerusalem at the centre. Aboriginal maps can only be properly read or understood by the initiated, since some of the information they contain is secret. This secrecy concerns the ways in which the map is linked to the whole body of knowledge that constitutes Aboriginal culture. For Aborigines, the acquisition of that knowledge is a slow ritualised process of becoming initiated in the power-knowledge network, essentially a process open only to those who have passed through the earlier stages. By contrast, the Western knowledge system has the appearance of being open to all, in that nothing is secret. Hence all the objects on the map are located with respect to an absolute co-ordinate system supposedly outside the limits of our culture. One could argue that in Western society knowledge gains its power through denying, or rendering transparent, the inherent indexicality of all statements or knowledge claims. In the Western tradition the way to imbue a claim with authority is to attempt to eradicate all signs of its local, contingent, social and individual production. Australian Aborigines on the other hand ensure that their knowledge claims carry authority by so emphasising their indexicality that only the initiated can go beyond the surface appearance of local contingency. 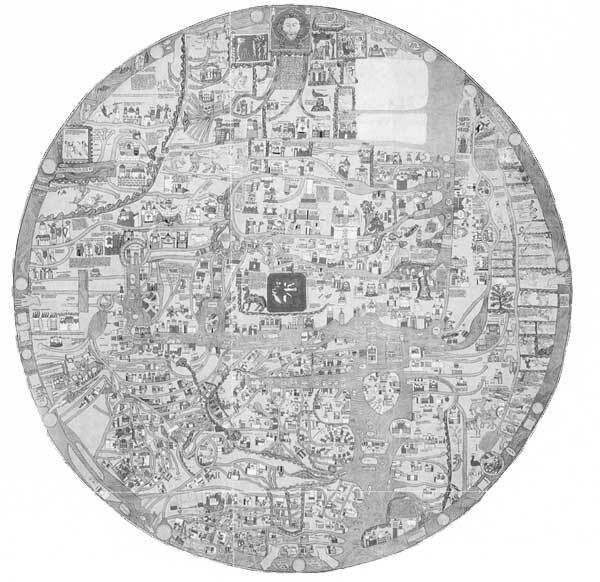 In the light of these considerations we should perhaps recognise that all maps, and indeed all representations, can be related to experience and that instead of rating them in terms of accuracy or scientificity we should consider only their 'workability' – how successful are they in achieving the aims for which they were drawn – and what is their range of application. If you look at ITEMS 7.1, 7.2 and 7.3, some rather curious features of the development of Western maps emerge. 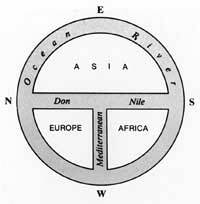 Ptolemy first drew his map in the 2nd century AD and it displays an impressive knowledge of the world. It contrasts strongly with Hereford map from 1300 AD, which by comparison is highly inaccurate and limited in its coverage. However, the Hereford map is a T-O maps (ITEM 7.2) and serves religious interests as well as topographical ones. The orthodox account would have it that Western maps progressed; they became more accurate and more scientific. The apparent lack of progress shown in these maps is better understood if the differing interests of the makers are taken into account. Thus world maps serve different functions from topographical maps and have to be evaluated accordingly. The Ebstorf map (1235) is an example of mappamundi, drawn on T-O principles despite the availability of Ptolemaic maps like ITEM 7.1. Note Christ's head, hands and feet around the edge of the map.